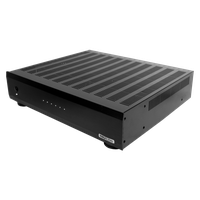 TRUAUDIO’s 12-channel power amplifier is a perfect solution for those multi-room audio installations that require flexibility and quality sound. With smooth appearance and versatility, this well-constructed amplifier has many features to enhance your installation and can be customized to fit any system. Features include: individual input sensitivity control for each channel, local source input for each channel and BUS 1 and BUS 2 source inputs, bridging between channels, and in and out triggers. The specially designed torroid transformers will minimize unwanted heat build-up to ensure the long life of the amplifier. No matter what brand of controller the system requires, this 12 channel amplifier will deliver audiophile sound and maximize your listening experience.